Tasked with performing an essential, multi-functional role, today's Procurement professionals have their hands full. Procurement's responsibilities are further complicated by inconsistent demand, crowded markets for talent and technology, and lingering misconceptions about the function's value. As Procurement teams have evolved, traditional support models have grown less effective in serving the function's goals and objectives. While traditional Business Process Outsourcing still has its uses, best-in-class Procurement teams require a more flexible and robust offering. The Procurement Help Desk from Source One is precisely this sort of offering. When organizations choose the Procurement Help Desk, they gain access to the spend management leader's full suite of resources. This includes a team of dedicated subject matter experts, a deep repository of market intelligence, and Source One's own proprietary Procurement technologies. Better still, clients enjoy this arsenal of Procurement support for about the price of a single hire. Source One's spend management team recently put this support model to the test in an engagement with a North American medical device manufacturer. What started as a nearshoring project ultimately matured into a multi-year series of initiatives touching dozens of spend categories and tens of thousands in spend across three continents. 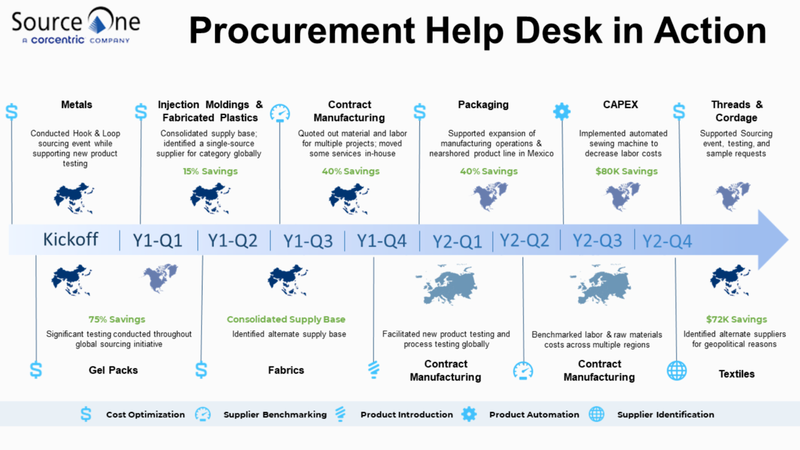 Through the Procurement Help Desk model, the medical device manufacturer not only realized considerable cost reduction in key commodity categories, but also successfully established more sustainable, efficient, and cost-effective operations. Armed with the knowledge gained throughout the engagement, the organization is now prepared to make more informed, strategic supply management decisions well into the future. Check out the timeline below to learn more about this engagement and gain a better sense of how the Procurement Help Desk supports organizations. To learn more about this successful spend management initiative and Source One's Procurement Help Desk model, check out Enabling the Business with On-Demand Supply Chain Support. This whitepaper outlines the benefits of the Procurement Help Desk and provides a case study its versatility and effectiveness.